Fatayer jenbeh or cheese pies are popular arabic pastries. You find them in bakeries, school cafeterias, cafe and pastry shops.They make a great start of the day or a wonderful companion for the afternoon tea.These arabic cheese pastries are great portable snacks or impressive pastry appetizers if you make them small enough. Fatayer el jebneh are typically boat-shaped but you can shape the dough any way you are comfortable with, I sometimes shape them the same way as the lebanese meat pies and other times I make them into triangles or circles, they are tasty in any shape so have fun with it. The cheese used for the stuffing is usually akkawi cheese mixed with a little kashkaval or cheddar cheese but you can use any salty cheese you like.You can add a variety of flavorings too cilantro, Nigella seeds or dried mint add another dimension of flavor but if you are a fan of plain cheese flavor feel free to use a plain cheese stuffing. To make the perfect arabic cheese pastry you need a combination of a dough that will hold its shape after baking, good quality cheese and the flavoring you like.Today I am sharing my go to recipe for making these cheese pastries along with a step by step “how to” shape them. Proof the yeast by mixing it with the sugar and water in a cup, the yeast should foam and bubble if it doesn’t then it has gone bad and you need to replace it with new package. Posted in Bread and pastry and tagged akkawi cheese, cheddar cheese, cheese pastry, cheese pies, fatayer jebne, nigella seeds, معجنات جبنه, تشكيل فطاير الجبنه. Bookmark the permalink. They are so beautiful, I like this shape. Thanks for the recipe. Have a nice day. Sawsan these are fantastic! I so want to make them … but I am not sure if I can find all those cheeses in my little town … is there anything I can substitute for akkawi and kashkaval? These look like they could quickly become my favorite snack – bread and cheese. Delicious! I like the addition of cilantro too – I wouldn’t have thought of that, but I know I would enjoy it. These sound really good, Sawsan! The combination of salty cheese with freshly baked dough must taste incredible! Thanks for sharing. Oh so excited to see this one and finally know what it is. They look awesome. Sorry for the delay Greg. Beautiful! These definitely wouldn’t last long at our house! I can’t wait to try them! These pastries are just lovely and it’s great that they are savoury. It’s difficult to tell how big they are from the photos, but I think I would make mine the small hors d’œuvres size! I am wondering what cheeses I might be able to substitute for the exotic akkawi and kashkaval? Would goats cheese and cheddar do? Or would Akkawi be more like feta? Thank you Eva, the size is really up to you, the ones in the picture are a little smaller than the palm of your hand. As for the cheese,you can try ricotta mixed with mozarella and a little salt , I think it will give a close result. These look delicious and beautiful! I’ve never heard of akkawi or kashkaval cheese – what are they like? Kashkaval is a firm , yellowish white cheese with mild taste that melts really well. Akkawi is a white firm cheese, that is salty and used quite frequently in arabic recipes, savory and sweet. Mmm, I can smell them baking now (I wish)! I think I would love them with the mint added as well. I love how the coolness of mint ‘sparks’ and balances out savory flavors so wonderfully. And anything with cheese . . . happiness! Wonderful dish, and a perfect snack! I am a big fan of cheese pastry, and had the chance to try Fatayer jenbeh once, a friend has served them on a party. Delicious! Highest time to try to make them at home 🙂 Love your first picture, Sawsan, it is SO inviting!!! This is a fantastic combination that I know I will love. Your photos are so beautiful! I adore this recipe and I love the step by step. Far superior to the odds and ends of pastry from her baking that my granny used to make “cheese straws” with! Lovely recipe!Thanks for visiting my blog.I’d love to try out some of your awesome creations here.Beautiful pics as well! I think it’s so sad that you are not my neighbor. I would really love to stop by for a couple of those gorgeous, gorgeous cheese pastries. I am so happy you showed us the step-by-step on how to shape them. That was my first question as I started to read the post. Have a very wonderful week ahead! Oh I wouldn’t mind a few of these for breakfast this morning! I’ll have to bookmark these. WOW! These look absolutely delicious! How can you beat tasty cheeses stuffed inside warm yeast bread?!?! Delicious! I love yeast bread, flavored, stuffed or just plain out of the oven. Hello! i`m so happy that I found your blog! Wonderful recipies with really nice pictures! Wish you a happy day! OMG, these look spectacular!! Could I make them with paneer if I can’t find the akkawi cheese or kashkaval? I am DYING for one right now! BTW..love your new photography venture and post idea! Looking forward to them! Thank you so much Lisa for the sweet comment and encouragement.. These are adorable, and look absolutely delicious! Cheese pastries sound so good, and I love your demo of how to fold them! Oh my goodness! These look amazingly good. I’ve had these many years ago, but have forgotten what they taste like. Will have to try making this at home! Sawsan, I always love your bread recipe. If you have a bakery, you will see me everyday! Look so yummy! These look so amazing. I love baking breads and pastries. Thank you for this recipe. I made these for the first time tonight for Ramadan dinner, my husband loved them and they were much easier than I thought they would be to make. Thanks to your wonderful step by step directions with photos! Thank you so much. My husband is from Syria and I spent 6 months there. We both love these and I was hungry for them. I tried a different recipe I found online yesterday and it was wrong. They made a mistake posting it so all my fatayer turned out like yummy little bricks we ate them but they were disappointing. So today I found this recipe and YUM!!! They were perfect. I had to use Nabilsia cheese and some mixed italian cheeses with fresh flat leaf parsley. They were delicious! Thank you this recipe is going in my favorites book. These are beautiful! They are similar to the Finnish ones filled with potato instead of cheese. Perhaps it’s because cooks world wide use what’s in hand and flour and potatoes are found everywhere. Or perhaps they travelled all the way to Finland via Turkey and Greece – we have them here too and we call them Peynirli (peynir = cheese). The Greek recipe uses full-fat yellow cheese and sometimes ham or bacon. Yours looks so much healthier – will try it someday and let you know how it turns out. Congrats for a great blog! I found your blog totally awesome….Oh! Sawsan I also live in Amman,Jordan.Who knows maybe you live right around my corner:)) Thanks for the beautiful recipes. Blessings on your house, Sawsan! I live in south Texas near the ocean. I think I will be completely at home with your delicious looking taste profiles – cilantro is surely a Texan’s middle name! I am happy that we could easily live next door to each other & share cooking for our families with great fun. This recipe especially will be a delight for my elderly parents, and they will greatly enjoy it! Thank you for your great consideration by sharing the love from your kitchen to ours. Hi, Sawsan. Just wondering about the cheese you used. I looked up akkawi and it says a white brine cheese so I was wondering if it would look similar to feta in its package. I am sure Cairo must have it or something similar. You are going to laugh because when I said I could wait to try them, I was not joking! 🙂 My dough has just finished its rising in the hot oven and I am about to cut it into egg-sized pieces. I don’t mess around! I am using feta I had in my refrigerator and cheddar with flat-leafed parsley and nigella seeds to fill. I’ll let you know how it goes. But so far, it’s going splendidly. They turned out gorgeous and delicious! My mother and sister are visiting and everyone is swooning over them. 🙂 Thank you! 🙂 I am really glad you enjoyed them Stacy! Thank you for letting me know how they turned out. I posted a photo and a link to your recipe on my Facebook page. Everybody should make these! They are so great! I meant COULDN’T wait, of course. I’ll have to see if i can find akkawi cheese…how is it different from labneh? Jazakallah Sawsan! I will try to find Akkawi..can’t wait to try this! I ended up with a bunch of leftover paneer (Indian curd cheese) from my pea, potato and cheese samosas and was curious whether it would would make a good filling for these cheese fatayer. I have some sharp old cheddar in my freezer that I could add as well as salting the paneer carefully if the cheese needs to be similarly salty to feta cheese. No yogurt either … maybe sour cream? Just trying to come up with ideas. I posted the samosas recipe plus a post in how to shape them in the last couple of days. Also gulab jamun, the fried Indian milk balls soaked in syrup. I was wondering if this was do-able with feta cheese… it is hard to find good kashkaval and akawi in my area. Hi just made these wonderful little treats. I had some akkawi and found your recipe. They turned out great. I did have a little trouble shaping them and the cheese leaked but I do like the crunchy parts. I substituted the nigella seeds for caraway seeds. Thanks for the fabulous recipe! Sorry for being annoying, Sawsan, but I printed out the recipe last night and today I went downstairs to start making the dough when I ran into a problem. Your recipe lists the use of 2 teaspoons of sugar which are presumably used in proofing the yeast, in this step. But then, in the next paragraph you write. Where does this other amount of sugar come from? You can either use both teaspoons of sugar to proof the yeast or you can divide them by usig one to proof the yeast and the other to mix with the flour and baking powder.I usually use both to proof the yeast. Thank you for clarification. I thought I had missed something but now I can FINALLY get around to making the fatayer. I’ve bought several kinds at one of the local bakeries but wanted to try them myself. Hopefully my dough will be as soft as theirs. Just wanted to let you know that I FINALLY made cheese (and mushroom) fatayers today. Not as good as yours, certainly they were not as pretty, but they are done and the cheese ones were very tasty. On cooling, the mushrooms ones were ok as was the sole zaatar one I made with some scrap dough. I am glad you finally got to make the fatayer and that the cheese ones were tasty. yuhuuu!!! u r great!!! m 17 yrs old gurl n considered a bad cook in house!! bt i rocked in my family wen i made these..i live in kuwai & dis a famous dish here! thanx aloooooooot…. 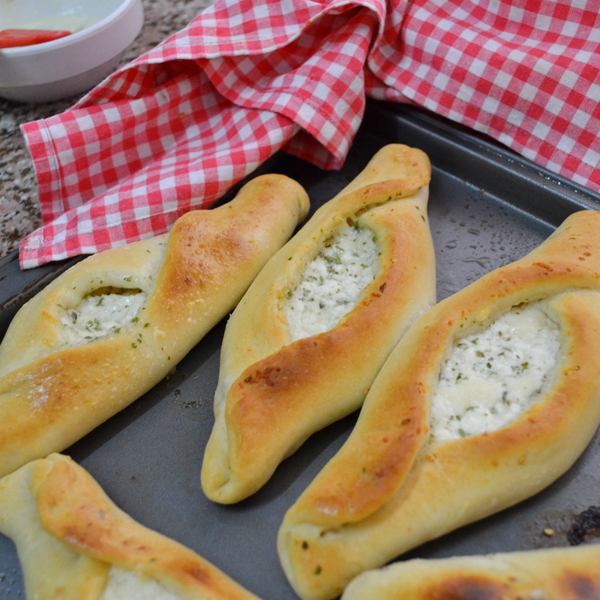 Another recipe I’m overjoyed to find — they look like ‘pide’ which we ate often in Turkey, a soft, squishy dough with cheese and herbs, shaped like a boat — and we’ve been craving those food and flavors — so thank you for this! These fatayer are a personal favorite.I hope you will enjoy them too. Thank you so much for this recipe.it looks wonderful.i must try it.i am from Iran and i’am very happy to see a muslim women on internet. assalam o aloikum! tried the recipe and it worked really well. i used paneer nd cheddar along with spring onions, green chillies some black pepper and thyme as filling and the combination was yummy. Besides cheese pastry i made zaatar bread using the same dough which turned out to be equally good. Hats off sawsan! looking forward for fatayer lebneh recipe. Keep up the YUMMY work! ma’s salamah! THANK YOU SO MUCH. JazakiAllahu khair! This recipe was a winner. The dough was bomb.com! Can I use this dough for all kinds of fatayer? Even honeycomb bread? I’d love it if the answer is yes! This dough is THE best I have ever tried for Fatayer and no mujamalat 😉 MashAllah so soft and perfect. Definitely a keeper and Im so happy I’ve come across this! I’ve tried tons of dough recipes and this is what I’ve been looking for! Had many failures making fatayer. But today it was perfect using your recipe . Thanks for sharing. Hello Sawsan, thanks a lot for the wonderful recipes, May Allah bless you. Jazakallah khairan I baked today and they smell great. Need to work on the size though. I would love to try this tomorrow, can you plz let me know if I have instant yeast do I still need to proof it with water? If not then should I use the same amount mentioned in your recipe. I made these last night & they were excellent! I just did not have a rolling pin and had the dough out for quite a bit so it was very hard to roll very flat. This ended up with various shapes of fatayer bil jiben & I had two that unfurled. Astonishingly, I also made fatayer bil sabanegh and those did not open at all, I really thought they would, but they defintley lost their nice shapes. I wish I added more sumac and lemon to them! Thank you for the great recipes & photographs! Hi Sawsan, I wanted to give these a go today. Unfortunately, I live in Toronto and its difficult to find Akkawi and Kashkaval cheese. I know you mentioned in previous comments about substitutes. Is ricotta the substitute for Kashkaval? And the mozzarella the substitute for Akkawi? How much should I put of each, instead of the two arabic cheeses? And how much salt should I add? Thanks!!! I’ve tried your other recipes, and have loved them. So I’m excited to try these! You need a firm salty cheese to substitute the Akkawi. Do you have paneer? you may be able to find it in Indian stores, it could work. As for the Kashkaval, you need something that will melt but still it needs to have flavor, perhaps some Monterey jack cheese. Hi Sawsan! Would feta cheese work as well? Hello Sawsan, all your food looks so beautiful! I was wondering if your cheese fafayeh could be made with sourdough instead of yeast? My mouth is watering looking at these! Could you tell me what flour do you use to make the dough? Bread flour? All-purpose flour? Thankyou ! LOVE this dough recipe but have a question … when doubling quantity would I simple double everything else including yest amount ? The quantity would I simply double All ingredients including yeast amount ?